Abe Cohen Plumbing and Heating Inc. is who you need to call for residential water entrance (water main) in Ahuntsic, Baie D'Urfe, Beaconsfield, Bord du Lac, Cote Saint-Luc, Cote St-Luc, Dollard des Ormeaux, Dorval, Downtown, Hampstead, Ile Bizard, Lachine, Lacey Green, Lakeshore, LaSalle, Laval, Mile End, Montreal West, NDG, Nouveaux St. Laurent, Nun's Island, Old Montreal, Outremont, Pierrefonds, Plateau, Pointe Claire, Pointe St. Charles, Roxboro, Ste-Genevieve, St. Henri, Town of Mount Royal, Verdun, Ville St. Laurent, West Island, Westpark, Westmount. The water from the city is delivered to your property line by the city. 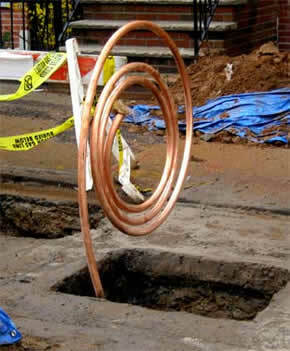 From the property line to your building(s), the main water piping is your responsibility. Installation and/or replacement of these pipes are done at your expense by your plumber. In the greater Montreal area, Abe Cohen Plumbing and Heating Inc. can advise you of the regulations for each municipality. We have the experience, expertise, and the equipment to keep you connected to the city's fresh water system, to investigate and to repair any problems that arise. Whenever possible, we will replace your water entrance (your connection to water supply from the city's water mains) without necessarily digging up the entire length from the property line to your house. We can often install a new water line from a single hole dug near the city valve. At Abe Cohen Plumbing and Heating Inc., we are a three-generation family business with more than 50 years in the plumbing trade. We consider our customers to be family and friends in a long-term relationship with us. We have the experience, expertise, tools, and equipment to install, repair, or replace a residential water entrance (water main) in the greater Montreal area. We are respectful, clean, and professional. We are certified and active members of CMMTQ (Corporation des maïtres mécaniciens en tuyauterie du Québec), ACQ (Association de la Construction du Québec), and certified partners of Gaz Métro for natural gas piping and installations.